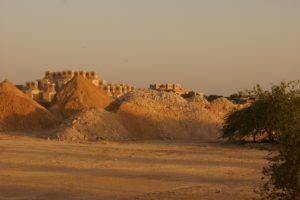 While the New Directions in Sustainable Urbanism research agenda makes some references to Qatar and the Gulf Region, it is intended to have a more generic and wide-reaching scope and to focus on the Social Sciences – or the social and human aspects in technology and science-based research. In academia and research, particularly in the Middle East region, there is a tendency for research funding to privilege science and engineering, which generally ranks higher in journal publishing and other outputs. Understandably, the hard sciences often require greater funding sources to conduct research due to the high cost of equipment, but it is increasingly necessary to elevate research and support development in the social sciences. 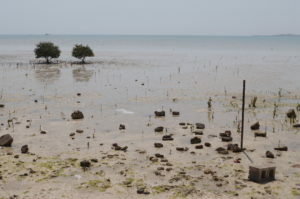 Mangroves Al Thankira © Dr. Anna Grichting. From now until 2050, 93% of total growth is expected to happen in the developing world and the rise of urban populations will predominantly take place in medium size cities in Asia and Africa. Currently, over 800 million people live in slums with a majority in Africa, Asia and South America. The prevailing urbanization model has been dominated by real estate visions and values, with the automobile as main transport mode. The resulting urban form is generally characterized by a high level of zoning, tall buildings or superblocks, freeways, decorative landscape (as opposed to functional and ecological landscape), and a high contrast between formal (blocks and superblocks or gated communities) and informal neighborhoods (slums). In rapidly urbanizing nations, this has created increasing social economic disparities (increase in the gap between the rich and the poor), increase of informal urbanization, poor safety and lack of governance. The rapid urbanization affects planning and provision of basic infrastructures and services (water, sanitation, energy) resulting in a poor percentage and quality of public spaces with low density urban forms, population overcrowding and traffic congestion, high unemployment rates (with over 50% of youth) and an informal economy that at times reaches 70%. This also reflects a weak public sector that does not incentivize economies of urbanization or economies of agglomeration and the city loses its prime role as a multiplying wealth generator. While there are many challenges facing cities and urbanization in the 21st century, there are also opportunities to create more sustainable cities and urban regions. Accessibility of technologies to communicate, gather and share information and data, networks and citizen led initiatives, online education and training, increasing offer of micro-scale infrastructure to produce energy (solar), clean water, or produce food, new financing models (public-private partnerships, micro-credits and crowd funding) – are amongst the societal and technological developments that can positively affect change in an urbanized and urbanizing world. These are accompanied by novel approaches to more ecological and systems thinking applied in architecture, urban and landscape design, as well as models of urbanization that are not only top down but also generated from the bottom up. Co-creation, citizen-science, community led design are amongst the emerging trends that are steering the social sciences back to the center of research in sustainable urban design. Culture and Regeneration: abandoned village. © Anna Grichting. 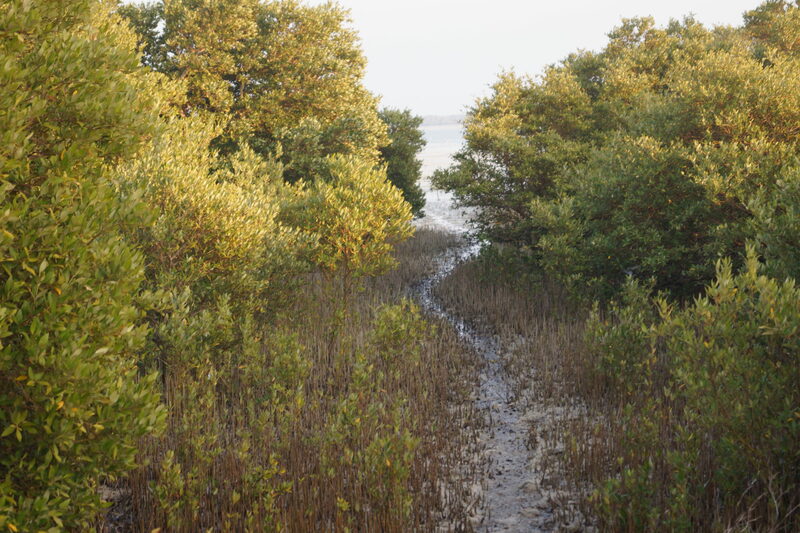 Mangroves Al Shakira. © Dr. Anna Grichting. Cities are regenerative systems and, like all organisms and ecosystems, run on positive and negative feedback loops. Positive feedback loops stimulate growth and expand a system; negative feedback loops limit or contain a system within boundaries. Limits, or boundaries, through containment, actually help a body to function well and build its resilience – the length of an arm stretching, the containment of muscles, ligaments, bones within skin. When limits are known and boundaries are set, resources are allowed to circulate within a system, nourishing different parts as they pass through and regenerating their energy.² An example of is the soil cycle. ³ The concept of resourcefulness is also highly relevant here. This is measured as how many times a resource can be looped before it leaves an organism. With each pass of a resource, more energy is built instead of lost. The Urban Edge, and Interface. © Dr. Anna Grichting. Much of what a city considers waste is actually a valuable input and a start of a regenerative system. Organic waste from landscape companies, produce and animal markets, restaurants, homes, hotels, office complexes and universities could be collected and composted to create soil amendment and healthy, moisture-holding local soil not dependent on the chemical fertilizers and imported organic materials currently used. Trees that die and pruned branches would be laid down, buried or chipped and allowed to decompose to support fungal communities. ⁴ It is therefore vital to revalue the city’s waste streams as foodstocks and set up processes to redirect them to feed other systems within its organism/ecosystem. Aside from the organic waste streams, we should also consider the inorganic waste streams (glass, metal, etc), and new forms of recycling such as urban mining. Urban mining is defined as actions and technologies designed for the recovery of materials and energy from products of the urban catabolism, providing a systematic management of anthropogenic resources stocks and waste (products and buildings), in the view of long term environmental protection, resource conservation and economic benefits. ⁵ For example, the gold concentration in electric and electronic scraps is considerably higher than the amount of gold in gold mines, recovery of gold from may potentially result in a more ecologically compatible mining activity. 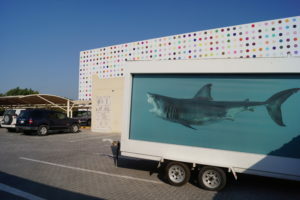 Public Art and the City – Damien Hirst in Doha. © Dr. Anna Grichting. Many urban areas are polluting their landscapes with landfills and trash. The cities of the emerging urbanizing world – in Sub-Saharan Africa and Asia – are generally more resource efficient and have been recycling their materials out of economy and necessity. Urban mining is becoming a new form of employment and income generation in cities, which also contributes very positively to urban sustainability. Permaculture Food urbanism symbiosis. © Dr. Anna Grichting. 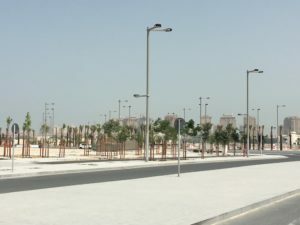 Lusail public realm – Qatar’s new Smart City under construction. © Dr. Anna Grichting. 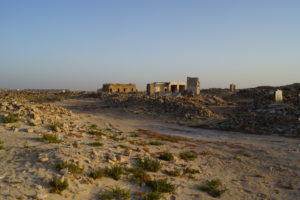 The future green belt proposed for Doha, Qatar and the region should not be isolated in its concept and function but more integrated into people’s lives via community-designed roundtables guided on the principles of agro-ecology. ⁷ Action research can engage communities, investigating the Green and the Grey/Black, what is above ground and below ground level. Green Infrastructure should also be researched from the micro to the macro scales, and also from the concept of Flux rather than the idea of Balance. Bioreceptive microorganisms – for examples lichens – are barometers of air quality. They create symbiotic relationships with other organisms (host organisms). 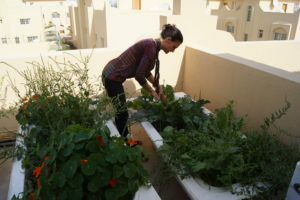 Rooftop Permaculture in Qatar. © Dr. Anna Grichting. 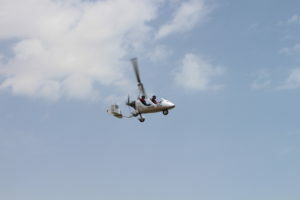 The aim in biourban restoration is to bring about a flexible city which can coexist in harmony with the different pulses of nature, especially the sea taking in regard the opportunities rising up with the climate change, but also rainwater events, providing the chance for regeneration of dust storms with the opportunity to harvest soil materials from elsewhere for the benefit of bioregeneration of spaces in the city. Capturing the rising amount of rain, storm waters and dust creates the resource and material for establishing new urban organic layers key to the city’s sustainability. Materials brought to the city – whether water from the sea (desalination or sea-level rise or storm surge) or dust from storms — have the potential to transform a desert into an oasis. With a combination of modular environmental technology, open form infrastructure and landscape urbanism these material streams will become a steady source of power for the new organic layers of the city composed of parks, trees, water elements, wetlands, green roofs, wild nature, urban farms and collective gardens. These layers reduce the heat-island effect of the city, produce a comfortable micro-climate, encourage pedestrian movability, create an attractive public entourage and a new urban ecological luxury. 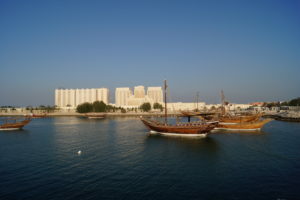 If the sea is invited to be an active part of the cityscape by introducing a series of controlled cracks in the flood defense walls and by designing the free water movements within free spaces in the city, Doha will be prepared to deal with the future rise of the sea level and changing weather conditions. The urban water elements will also act as stormwater relief channels and contribute to the microclimate of the city. 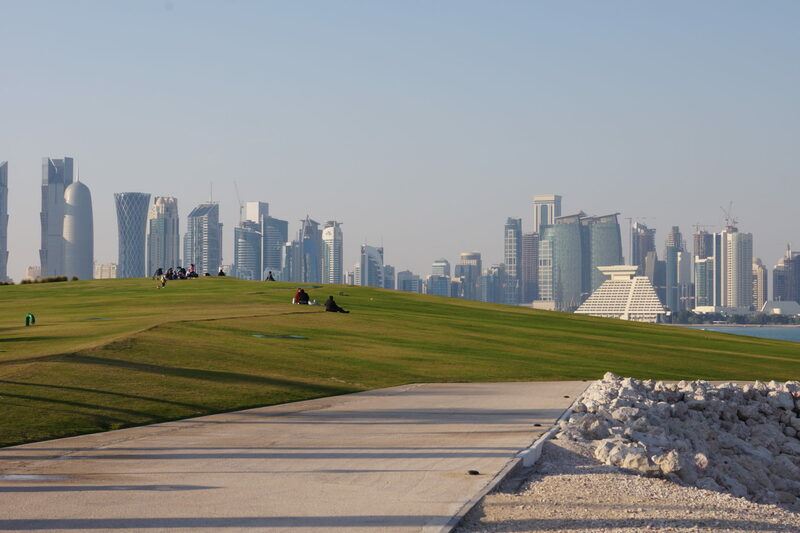 New mixed-fresh and salt water greenery will be introduced into the city, developing Doha into a partial urban mangrove and inviting back original site-specific forms of flora and fauna. In a biourban city, all communities must thrive. The biourban development of a city to support its future sustainability must be connected with the collective conscious, and with subconscious knowledge and understanding of the different layers of the existing communities. 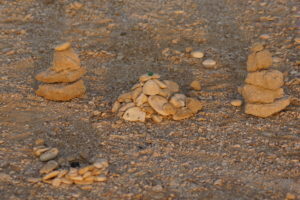 Local knowledge – ancestral knowledge – will re-surface to the street level once industrial control is opened up in order to let nature to step in – including human nature. The expatriate communities also bring their own knowledge and practices to shape the cities and landscapes. This will also create new local knowledge as a key element for the ownership of the shareholders of the organic future. How best can this new knowledge be harnessed and shared? The Third Generation City is proposed as the organic machine of the future. ¹³ There is a shift from the industrial and patriarchal to the organic and matriarchal. Designing the third generation city is not just about shaping new urban forms and urban infrastructures, but looking at the inbetween spaces – at the cracks in the existing city – and working on these. 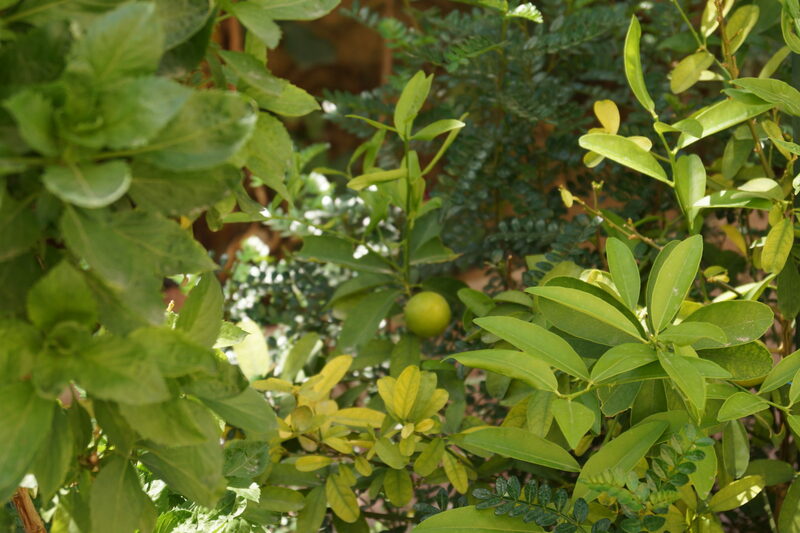 Permaculture: the campus as a microcosm of the city. © Dr. Anna Grichting. 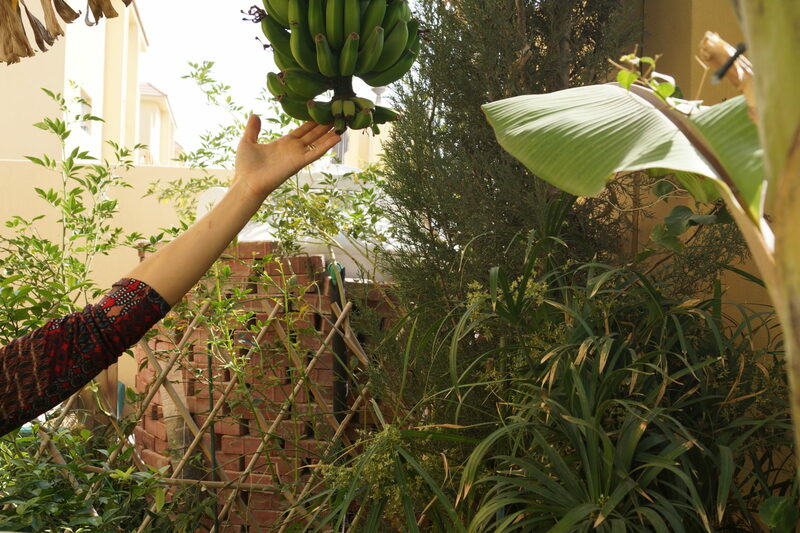 There are pioneering Edible and Sustainable University Campus and Desert Farm projects at Qatar University, each with strong sustainable value, which can be developed in the future as one mutually beneficial and collaborative urban project. 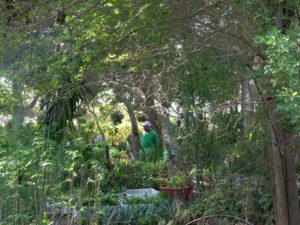 Desert Farms signifies transformation through permaculture, with plants to preserve the soils and create a more protected microclimate and ‘growing’ farm buildings from the geology, recycling stone that lay in the soil for foundations, and reclaiming farm timber for construction. This enables the possibility of creating a vernacular that draws from the land, merging built form and forest clumps to cool, protect and sustain. Permaculture food urbanism, symbiosis. © Dr. Anna Grichting. A campus landscape is articulated by wadis, ephemeral riverbeds that comes to life during heavy rainfall. In these valleys, the natural topography supports forests of self-seeded vegetation that express indigenous characteristics of the place – ‘fields’ of restricted access and biological research – rather than integral to the campus experience. They display the vital interrelationship of soil, water and vegetation as natural assets to be mapped, explored and promoted as part of the campus ecology. 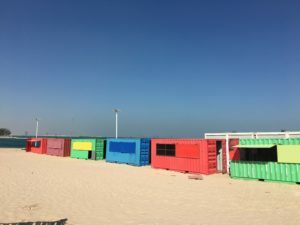 Temporary urbanism at The Pearl, Qatar. © Dr. Anna Grichting. 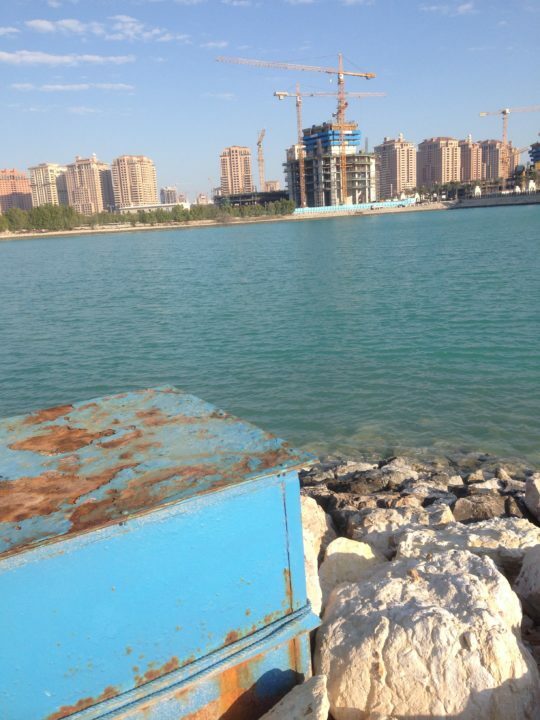 The Pearl, Qatar: artificial island under construction. © Dr. Anna Grichting. 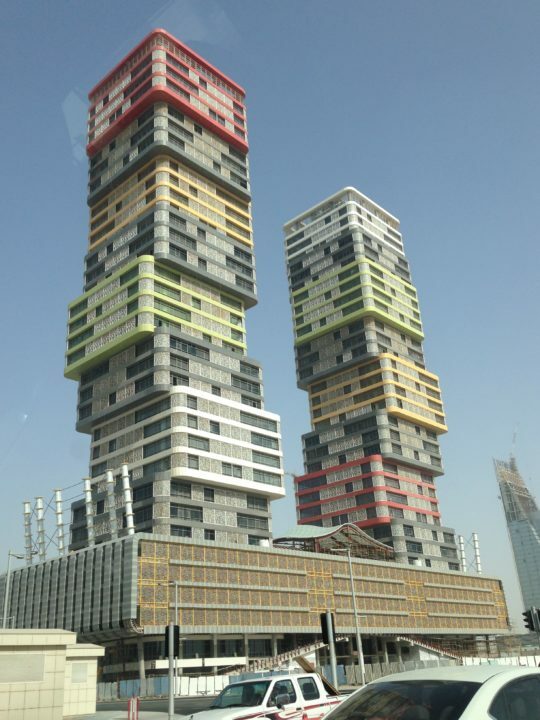 Lusail City towers. © Dr. Anna Grichting. There is a need for collaborative and participative design to develop and/or redevelop local environments in a way that is sustainable in a holistic sense, building knowledge and responsibility. Through the process of community involvement, overlapped with design, construction and maintenance, sustainable design can be co-designed. Design becomes a creative process of problem solving involving dialogues across mixed groups of people, transcending boundaries between professionals and communities, and facilitating collaboration between different stakeholders. It mediates power balances and reveals existing informal knowledge and ambitions and dreams. It also builds existing knowledge and skills within communities, otherwise known as social capital, translatable in many instances into new jobs and platforms. It encourages trust, ownership, pride, responsibility, a sense of belonging and commitment to a sustainable future. The ethos behind co-design activities is one of resilience in the face of changes – climate change, economic downturn or population growth or decline. 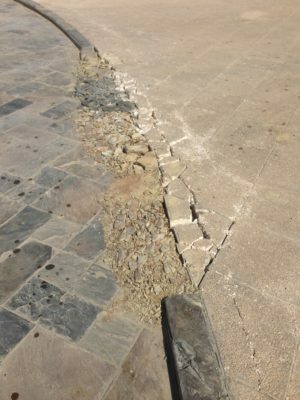 Participants need to perceive the city as an agile system able to withstand and/or bounce back, but simultaneously as an anti-fragile system, strengthening its resilience through disruptive change. This calls for commitment to research of the city as a complex adaptive system, building shared agro-ecological knowledge and on how to design from this paradigm. The focus is on co-design activities in the more fertile parts in the urban system so that the city can slowly transform into a green and blue urban environment. Waterfront public spaces, Doha. © Anna Grichting. New urban and rural mobilities. © Dr. Anna Grichting. Qatar University: campus as microcosm of city. © Dr. Anna Grichting. Working with local materials. © Dr. Anna Grichting. 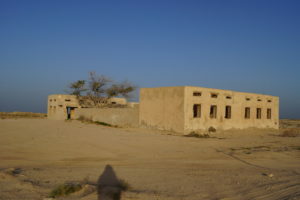 Culture and regeneration: abandoned village. © Dr. Anna Grichting. Regeneration of the Blue Cities and Ports. © Dr. Anna Grichting. New mobilities. © Dr. Anna Grichting. 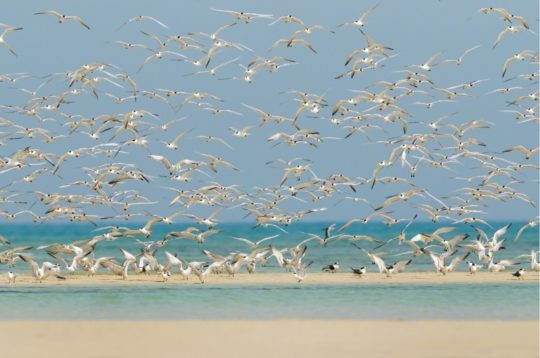 Birds – biodiversity Al Fuwairit. © Dileep Kumar. Post-carbon cities have recently emerged from a rupture in the carbon-dependent urban system that has led to high levels of anthropogenic greenhouse gases. This threat requires a paradigm shift in thinking about and planning relationships between energy, climate change and the city, in order to respond to the multiple challenges of climate change, ecosystem degradation, social equity and economic pressures. Recent European Union research has revealed that policy makers may be ignoring the human factor in energy transition to the detriment of rapid and significant change across Europe. This implies significantly less emphasis on technology and on top-down planning and more emphasis on the enabling of both individuals and social groups to articulate themselves and participate in the energy transformation. One of the key challenges is the lack of high-quality, comparable data on city sustainability performance, operational planning, design and management and quality of life. This paucity of truly comparable data is a major deficiency for many key strands of research on sustainable urbanism, including urban mobility, infrastructure and housing development, resilience, and natural resource management. Technology-centred smart cities are not enough: citizens want human-centred responsive cities. Urban design, urban sociology and behavioural science are central areas of research to achieve this vision. ²⁵ The challenge is to engage the cognitive capacity of citizens, especially young people. Citizens Design Science is geared towards better urban design, urban governance, urban management. At present, smart cities are digitized – but not smart. For example the concept of the Swiss smart city is a maximum quality of life and minimal use of ressources and it is planned that the future city of Zurich will be emission free. Research at the Future Cities Lab (ETHZ Zurich and Singapore) is looking at the concept of the quantum city and the the city– a combination of physical and virtual infrastructures and of complex models. It is a metabolism in movement, with various scales, stocks and flows. Antidisciplinarity means between and beyond disciplines. ²⁸ It’s time to go beyond the interdisciplinary to focus on a higher mission and on the changes needed in academia and research funding in order to allow more people to work in the wide-open white space between disciplines – the antidisciplinary space. Research needs to embrace people people who can move seamlessly between disciplines, people who translate and push the boundaries. Extradisciplinarity ²⁹ is proposed as a transformative spiral, a new sort of reflexivity – involving artists as well as theorists and activists in a passage beyond the limits traditionally assigned to their practice. It conveys a desire or need to turn towards an exterior field or discipline in an attempt to transform the initial discipline, to end its isolation, to open up new possibilities of expression, analysis, cooperation and commitment. Public-Private Partnerships for Sustainable Urbanism. How can cities adapt and evolve to forge new public and private partnerships (PPP)? A new concept – PPP + P – promotes Public Private Partnerships that put people first, that are elaborated for and with People. These participatory and co-creative Public Private Partnerships are leading to new ways of financing and maintaining construction and infrastructure projects that are physically and socially sustainable. A recent report (2015) by the United Nations Conference on Trade and Development (UNCTAD) emphasizes the need to engage and empower citizens in order to achieve long term goals and success by increasing citizens’ awareness and involving both the private and civic segments of society. Participatory Budgeting (PBP) is a new way of governing” that gives local communities more opportunities to influence how money in the public budget is spent. This concept of budgeting originated in Porto Alegre, Brazil in 1989 and has since spread around the world. It is time to establish a regional reconstruction strategy for the Middle East, that involves collective vision, broad participation, smart security, equality, and other key elements. The region, at all levels, now expects to be treated with dignity and to be the driving force behind its own development. It is high time to pull together to establish a “Regional Reconstruction Strategy” that maintains a holistic, problem-solving outlook while drawing on various forms of intervention (e.g. 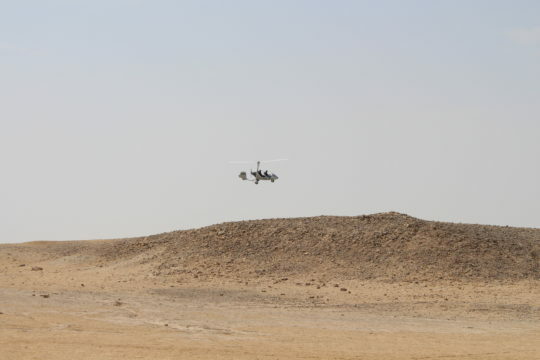 community driven development, inter-regional development projects, targeted counterinsurgency operations, stabilization, statebuilding, for example. What contributes to a city’s prosperity? And what is the relationship between prosperity and sustainability? We need to go beyond development goals and targets that adhere to ‘sustaining’ the same old economic and social models and advance more radical conceptual and practical approaches that challenge this reductive understanding of ‘sustainability ‘and integrate the concept of prosperity in dynamic socio-ecological systems. This paradigm shift may benefit from looking at examples in the Global South. In the last ten years, cities have grown 5 to 7 times – both in physical growth and population growth. This has resulted in many formal and informal forms of urbanisations- both slums and gated communities. During the same period, inequality has grown by 70% in cities over the last ten years. There is a need to bring in social sciences and not focus on technology based solutions for urban sustainbility– they must be integrated with people based solutions, with social engineering and citizen science. For example, it is people that use energy, and not buildings. Some successful programs have been developed in rural areas, that surprisingly do not concentrate on educating the youth, but on educating and training grandmothers. Turning grandmothers into solar engineers is one of Sanjit Roy’s priorities, and he favours women over men, as they maintain their roots in the village (or city neighbourhood) and pass on the knowledge to their children and grandchildren, while the men leave for the urban areas looking for jobs as soon as they had the skills.